Key Chain – 1.12 oz. Key Chain – 2.05 oz. Key Chain – 1.87 oz. Designed for the professional in mind, this flashlight has shock and water resistant epoxy sealed heads with unequaled light output to battery runtime. The twist on/off mechanism is the simplest and most reliable feature in the market today. The Eiger Ultra uses Quantum Tunneling Composite (QTC) Technology for variable light output. This allows you to adjust the light output from a dim glow to the brightest single AAA battery flashlight available. The Eiger Ultra uses a special optic that more than triples the light throw of the standard Eiger. 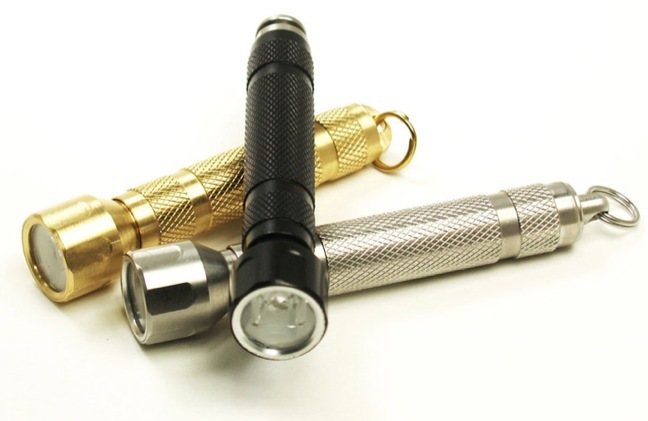 These flashlights are distinctive by a larger head and are interchangeable with all standard Eiger bodies. Eiger Ultra flashlight is engineered to use all different battery chemistries: Alkaline, Lithium primary, 3.7 Volt Lithium Ion Rechargeable 10440 or NiMH rechargeable batteries. Battery compartment comes in three options: Pocket, Lug, and Key Chain. All lights ordered through our site are custom assembled to your specifications. Tracking information will be forwarded when your order is complete and shipping. Because of the ultra-high output, Peak LED Flashlights are for professional use only and thus are not recommended to be used by children. Maximum light output can produce extreme heat and cause eye damage if flashed in face.